Which College Football Coaches Have The Hottest Seat in 2018 According to Fans? To answer that question, we recruited 500 college football fans from across the US to participate in a MaxDiff market research study. Each respondent viewed 11 sets containing four coaches. In each set they chose the coach they felt was most and least likely to be fired during the upcoming college football season. At the end of the study, we applied a Hierarchical Bayes estimation procedure to derive a full ranking of all 14 coaches on our list. To avoid controversy, we used the top 14 Power 5 coaches on the list from Coacheshotseat.com. If you’d like more information about each coach on our list, check out our post describing why each is on the hot seat. It really isn’t close either. One advantage among many of MaxDiff is that the rankings are not all the same distance from one another. In other words, the distance between first and second doesn’t need to be the same as the distance between second and third. 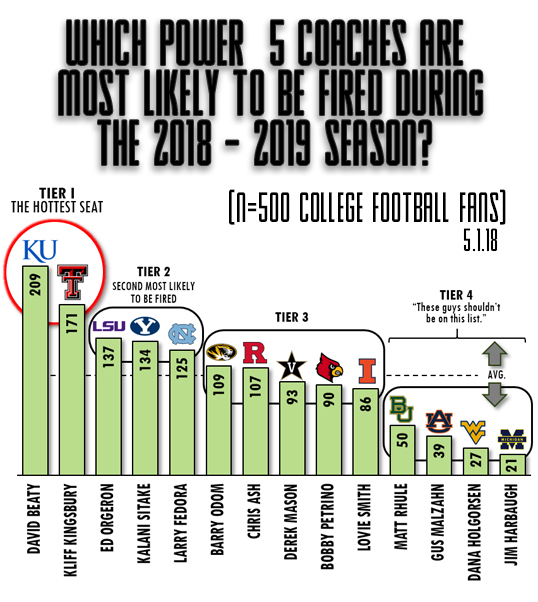 In this particular research study, you will notice quite a big drop from David Beaty in first place to the coach voted second most likely to be fired, Kliff Kingsbury of Texas Tech. This is reflective of a broad consensus that David Beaty is most likely to be fired of all the coaches on our list. It’s easy to see fans’ point of view on this one. Beaty enters his fourth season with a 3 – 33 record in three seasons with only one victory over an FBS opponent. The good news is that expectations are so low in Lawrence that Beaty may be able to save his job with only three or four victories this season, but that isn’t an easy task for a program that has won three games in the previous three seasons. On the 2018 schedule, the Jayhawks have four games against somewhat beatable opponents: Nicholls State, Central Michigan, Rutgers, and Baylor. We speculate that Beaty will have to win three of these four. Earlier this year, Kingsbury topped CBS Sports’ Tom Fornelli’s list of coaches on the hot seat for 2018, surpassing David Beaty. While our research suggests most fans will disagree that Kingsbury’s seat is hotter than Beaty’s, it’s still hotter than anyone else’s in the minds of most. In our data, the major drop off of over 30 points between Kliff Kingsbury (171) and Ed Orgeron (137) reflects a clear consensus that Kingsbury is the coach second most likely to be fired this season. By contrast, there is much less distinction between the MaxDiff scores of the next set of coaches: Ed Orgeron of LSU (137), Kalani Sitake of BYU (134), and Larry Fedora of UNC (125). Kingsbury’s five year tenure has been largely marked by good offense, truly atrocious defense, and mediocre results. Kingsbury currently sits on a 30 – 33 record with a 16 – 29 Big 12 record. To make matters worse, Texas Tech did not recruit well at all this off season. In fact, the Red Raiders earned the worst recruiting class in all of FBS for 2018. A big advantage of a Maxdiff exercise is that the results allow you to see situations where respondents have a more difficult time separating items in their minds. In this particular study, the similar MaxDiff scores of Ed Orgeron (137), Kalani Sitake (134), and Larry Fedora (125) suggest most fans will have a somewhat difficult time discerning which of these three they feel is most likely to be fired. Nevertheless, the results suggest that each in this group of three is viewed as having a discretely better chance of being fired than the next set of coaches. This research suggests fans view each of these five as having less chance of getting fired than those in the tiers above them. “I think after the last couple of seasons of massive coaching changes, there just aren’t enough “hot seats” to write about. But the writers still need the clicks to get paid, so they drum up a list of coaches at struggling programs who haven only been there 2 years, add Harbaugh for his massive draw, and boom, article written! There might be a bit of truth to this, as Rhule, Malzahn, Holgersen, and Harbaugh are mentioned on quite a few Hot Seat lists by major media outlets. Regardless, if you see these four names come up in the future, our research suggests it isn’t because fans feel they are in any danger.